The CareGiver Partnership announces its July prize bundle! On With Life” monthly sweepstakes. Readers can enter to win a reaching tool and a case of hygienic gloves. Each month we highlight a family caregiver solution — a product or service that helps seniors live more independently and gracefully in their homes. 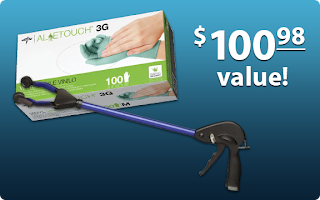 In our July giveaway, we’ve bundled a reaching tool that helps a senior with limited mobility remain independent and a case of exam gloves that are ideal for family caregivers. Aloetouch 3G Exam Gloves are ideal for at-home use by caregivers. Engineered to offer tear-resistant barrier protection during clinical procedures, Aloetouch gloves protect during home health care tasks such as incontinence product changes and wound care. This case of latex-free and powder-free gloves contains 10 boxes with 100 each and is valued at $75.99. Invacare Multi-Pik Reacher helps those with limited mobility or dexterity securely pick up items without excessive bending or stretching. Non-locking reacher is 26” long with an ergonomic, comfort-grip handle, fully rotating head and a handy magnet to pick up small items. This prize is valued at $24.99. To win, participants need only e-mail info@caregiverpartnership.com or mail a short statement explaining why the prize would be useful to him or her or a loved one. We will accept entries for this prize through July 31 and will notify the drawing winner within the first week of August. The CareGiver Partnership created the “Helping You Get On With Life” monthly sweepstakes to raise awareness of products and services that help seniors live independently and make caregivers’ jobs easier. To learn more about the two easy ways to enter and preview upcoming giveaways, visit our “Helping You Get On With Life” sweepstakes page. Call our friendly, helpful team of Product Specialists! Watch this video on what The CareGiver Partnership can do for you.